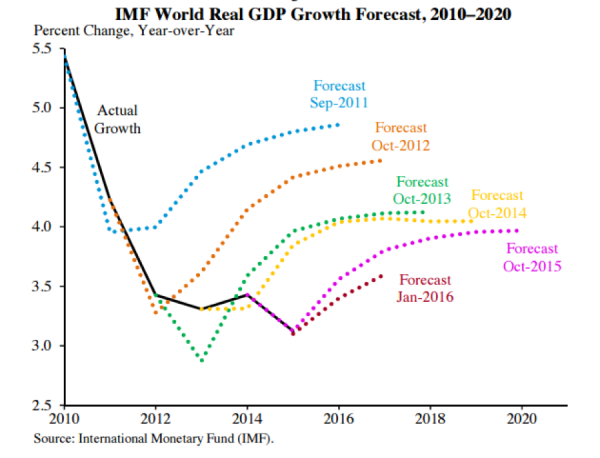 Why does the IMF keep badly missing its global growth forecast? And what does that have to do with the 2016 presidential elections? One of the key and largely overlooked reasons for this disappointing growth is the increasing global burden of private debt—the combination of business debt and consumer debt. Even though government debt gets all the headlines, private debt is larger than government debt, and has more impact on economic outcomes. In the U.S., total non-financial private debt is $27 trillion and public debt is $19 trillion. 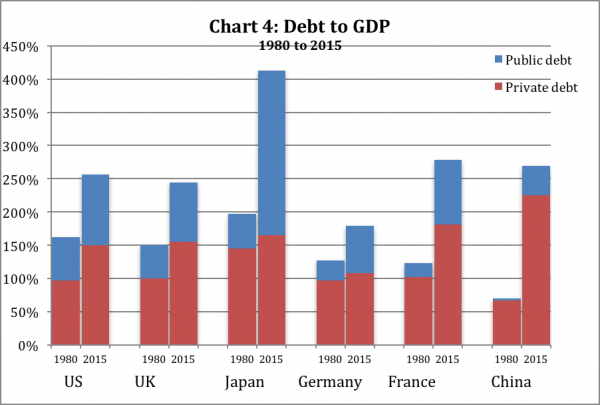 More telling, since 1950, U.S. private debt has almost tripled from 55 percent of GDP to 150 percent of GDP, and most other major economies have shown a similar trend. [See Chart 2]. Since GDP is largely the sum of all the spending and income of households and businesses in an economy, if aggregate private debt to GDP has tripled, that means the average businesses and households have three times more debt in relation to their income. The second problem it brings is much more subtle and insidious: when too high, private debt becomes a drag on economic growth. It chips away at at the margin of growth trends. Though different researchers cite different levels, a growing body of research suggests that when private debt enters the range of 100 to 150 percent of GDP, it dampens economic growth. When private debt is high, consumers and businesses have to divert an increased portion of their income to paying interest and principal on that debt—and they spend and invest less as a result. That’s a very real part of what’s weighing on economic growth. After private debt reaches high levels, it suppresses demand. Some economists have dismissed this impact since interest rates are low. However, most middle and lower income households (which is where the highest rate of debt growth has been), as well as most small and medium size businesses, pay interest rates much higher than money market rates. In the case of low-income households and small business, the rates on these loans can be very high, often an APR of 20 to 30 percent or more. And in addition to interest, all these borrowers have to pay down the principal balance of the loan. Further, an estimated 6.4 million mortgages of the 56 million mortgages in the U.S. are still severely underwater (have an LTV of 125 percent or more)—and millions more are less severely underwater or just barely “above water.” Many of these mortgages were made at the height of the boom. Since then the home values, and in many cases the incomes, of these borrowers have abated. Lower rates may help but do not solve their financial stress. And though their rates may be lower, all of these borrowers are now in a world where increases in income and revenue are harder to come by. This all takes a bite out of spending and investing. A side note on rates. The very fact that businesses and households are highly leveraged has a suppressing effect on rates for two key reasons. First, because they are highly leveraged, they have less ability to borrow more and are often wary of borrowing more. That decreased demand for credit results in downward pressure on rates. Second, when there is more debt, rising rates have a greater braking effect on the economy—if there is twice as much debt in the country, a Fed-engineered rate increase has twice the braking impact. The unprecedented amount of our global debt glut is underscored by the creeping presence of negative interest rates—a situation where the borrower, unbelievably enough, gets paid for borrowing. An estimated 15 percent of European corporate debt issued now has a negative interest rate. If the massive glut of debt is the culprit that is curbing demand, then perhaps this Central Bank experiment with negative rates is the inevitable response to this $150 trillion glut. But these negative rates are not available to low and middle income borrowers. U.S. private debt growth has disproportionately impacted the least well-off Americans. In fact, since 1989 (the year the Fed started a survey of this statistic), the debt level of the 20 percent of U.S. households with the lowest net worth has grown two and a half times faster all other households. And for all the talk of consumer deleveraging after the crisis, household debt to GDP is still 13% above the level in 2000, and 60% above the level in 1980. As mentioned, GDP roughly equates to the aggregate spending and income of the businesses and households in a country, and the private debt of a country is the sum of household and business loans. So to speak about the “private debt to GDP ratio” of a country is essentially the same as speaking about the “private loan to income ratio” of that country. You’ll recognize that ratio, because it is the same one that lenders have long used to help make loan decisions for individuals and businesses. Whether you are applying for a loan as an individual or for your business, if your loan-to-income ratio is low, the lender is likely to conclude you have capacity for more debt, and if it is high, the lender will likely conclude that you will struggle to pay your existing loan, much less qualify to take on additional debt. It follows directly that of a country’s private debt to GDP ratio is low, let’s say 50%, then the households and businesses in that country generally have low loan-to-income ratios and are well-positioned to power growth through increased leverage. And if a country’s private debt to GDP ratio is high, let’s say 200%, then the households and businesses in that country are generally overleveraged —they have on average very high debt ratios and are much less likely to be able to boost growth through more borrowing. 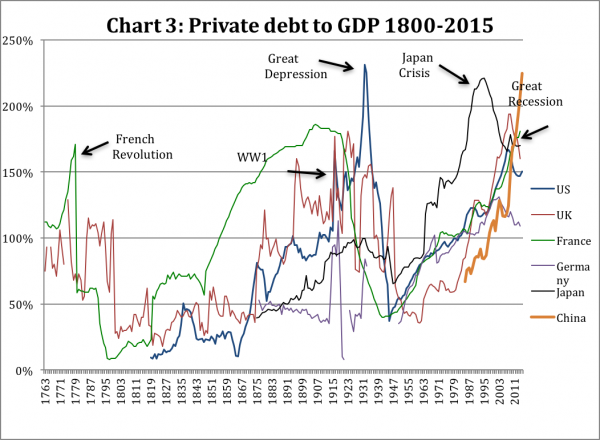 You can see that all six countries show more moderate levels of private debt in the early years of this period and much higher levels today, punctuated by private debt crescendos at pivotal moments along the way—the French Revolution, the crisis of 1914 that began immediately prior to World War I, the Crash of 1929, Japan’s Crisis, and the Great Recession. These crescendos are often followed by periods of rapid and painful private debt deleveraging, such as during the Great Depression and World War II. Notwithstanding the peaks and valleys along the way—all instructive and worthy of deeper study—the general trend is toward higher levels of debt. And the world has now reached a point where combined global government and private debt to GDP is the highest by far in history. As mentioned, short bursts of runaway growth in private debt have often led to crisis—the U.S. in 2008 and Japan in 1991 to name just two. That is because so much lending occurs that it results in overcapacity: far too much of something is built or produced—housing and office buildings are two examples—and too many bad loans are made along the way. In fact, so many bad loans are made that they approach or exceed the amount of bank capital in the system. So inevitably, the economies of these countries need to slow to a crawl to allow demand to catch up to this overcapacity, and the banks need to be propped up or rescued because of the extraordinary amount of bad debt. Importantly, the role and importance of private debt has been marginalized in the two leading schools of contemporary economic thought. And that’s why they both missed forecasting the crash of 2008. The “doves,” those who favor government management of the economy through interest rates and deficit spending, were confident the future held a continuation of the supposedly benign economic era they had termed the “Great Moderation.” The “hawks,” those that favor a hands-off policy on the part of government and strongly opposed government deficits, made dire forecasts of much higher inflation because of the high levels of government debt. Neither focused much on private debt, and the predictions of both were far off the mark. What greater indictment can be made of an economic theory than that it failed to forecast the greatest economic calamity in seventy years? Yet both schools of thought remain largely unchanged and unrepentant. Because this private debt burden suppresses spending and investment, growth rates in the U.S., Europe and Japan—which have private debt-to-GDP ratios of 150%, 162%, and 167%, and 2015 real growth rates of 2.4 percent, 1.9 percent and 0.5 percent respectively—will continue to frustrate policymakers and economists. Real U.S. growth rates were 1 to 2 percentage points higher for most of the post-World War II period. Even a 1 percent higher growth rate in the eight years since the crisis would have resulted in $1.2 trillion more in GDP today. And now China is on the verge of joining this mediocre-growth club. 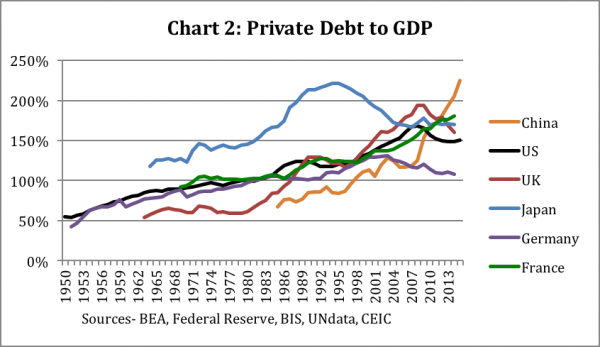 As we forecast in this journal in early 2015, China is now beginning to suffer the consequences of its recent private debt binge. Since 2008, it has poured on $18 trillion in new private (or non-government) loans. The proverbial chickens are now starting to come home to roost. In the summer of 2015, China's stock market collapsed by 45 percent. Its economy is decelerating. Its skyrocketing private debt ratio has now reached 231%, bringing a level of overcapacity that makes a continued slowdown in its growth inevitable in order for demand to catch up to a now-staggering oversupply of housing and commodities. As recently as 2011, China’s growth rate was 15%, but is declining and is now reported by Chinese authorities as 6.7%, though many prominent analysts believe it is 4% or less. In its rush to grow, China has simply built far too many buildings, and produced far too much steel, iron, and other commodities—and made far too many bad loans in the process. Its overcapacity is so pronounced that it will be years for true demand to catch up with this oversupply. That’s a central part of the reason the IMF keeps overforecasting global growth. The IMF is having difficulty accepting the amount of correction that will be required. In fact, the IMF recently reported that fully $1.3 trillion of corporate loans in China, or one-seventh of the total, are owed by companies whose profits don’t cover their interest payments, a problem that could trigger bank losses equal to 7% of gross domestic product if the issue isn’t addressed. Because China is still pouring it on, it continues to boost some growth and provide some support to commodity prices, however, in so doing, its eventual problem will be both worse and longer lived. Remember that Japan’s crisis of the 1990s took eight years to unfold—after very high GDP growth in the 1980s fueled primarily by runaway lending, Japan suffered a stock market crash in 1990, then a real estate collapse in 1991, and finally a bank rescue in 1998. And Japan has posted twenty years of near-zero growth since that rescue. China’s ultimate problem is two-fold. First, its growth rate will continue to slow to very low levels, perhaps, similar to Japan, for as long as a generation. Second, the oversupply will continue to mean downward long-term pressure on major non-agricultural commodity prices—deflation. Not just for China but for the world. This slowdown in growth will spill over to the rest of the world— contributing to the continued mixed growth results in the U.S. and Europe. China’s unfolding crisis will not have as big an impact as the 2008 crisis, since that crisis stemmed from runaway private debt growth in countries representing 67% of the world’s GDP. But it won’t be small either, since China and other runaway lending countries that are economically intertwined with China such as Australia and South Korea together constitute 31 percent of world GDP. The most immediate impact of China’s slowdown will be a dampening of the economy in other parts of Asia Pacific, such as South Korea, Australia, Thailand, Vietnam, Singapore and even Japan. Africa and South America will continue to be profoundly impacted too, because both continents are disproportionately dependent on commodity exports. Take South America, where real GDP growth has collapsed in the last 5 years from over 5% to less than 1%, due as much to reduced demand from China as any other factor. All in all, the world can be characterized like this: The U.S., Europe, Japan, and China—the big four—together constitute almost 65% of world GDP. These four have collectively been the engines that have powered global growth in the post-World War II era. But of these four, only China has shown rapid growth in recent years. China’s growth is now decelerating and will trend much lower in coming years. All four are now overleveraged and as a result will find it very hard to return to high growth. So what will be the next source of global growth? The growth of most of the rest of the world, largely Africa, South America, and the Middle East (which are much smaller than the big four in economic terms) is driven in large measure by exports of raw materials and commodities to these big four. So their growth will be muted as well. India is sometimes mentioned as a potential driver of economic growth, but it is only 3% of world GDP, so even if it has high growth, the impact globally will be small. Given this high global leverage, it is not unreasonable to think that the world’s combined real growth rate will stay moderate or low for a generation. Welcome to the new era of sub-par growth. Although I believe public debt deleveraging is a less pressing issue than private debt deleveraging— after all, governments can always resort to printing money while households and businesses can't—they will both be a very big part of what defines the economic era ahead, so let’s briefly examine them both. The first thing to understand, however, is that in developed countries over any sustained period (absent a calamity such as the Great Depression or World War II) total debt always grows at a rate roughly commensurate with GDP or at a rate greater than GDP. In fact, private debt alone usually outgrows GDP. And when, during a war or crisis, debt declines in ratio to GDP, that fact is integral to understanding that calamity. Debt grows as much or more than GDP because it is a necessary and causal factor in GDP growth. It’s one of the axioms that must be understood to understand the modern world. For example, during the period from 1985 to 2002, which is referred to reverentially by some economists as the “Great Moderation,” GDP grew by $6.6 trillion, but total debt grew by $14.9 trillion, taking America’s total debt ratio from 155 percent to 198 percent. Private debt alone grew by $10.7 trillion. Moderation indeed! In fact, the most benign period of debt growth since the aftermath of World War II was 1958 to 1968, when total debt declined on a percentage basis from 130% of GDP to 126%—a trivial amount of deleveraging. 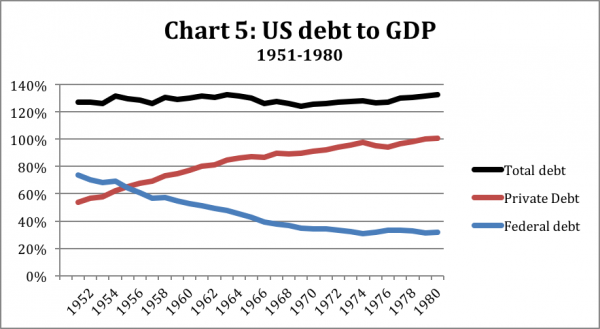 But even then, absolute debt outgrew GDP. But even given these rare moments of slight deleveraging, the path of debt in that overall postwar period has consistently been to dramatically higher levels—doubling from 127% in 1951 to 255% today. Some economists assert that establishing causality from debt to economic growth is difficult. That may well be so. Nevertheless, in my everyday experience over forty years in business as the CEO of three businesses and then as a private equity investor, the majority of the companies I am familiar with depend on debt for growth and expansion. In fact, without debt, most economic activity would grind to a halt. If you want to buy or build an office building or a house, it usually requires a loan. If you want to open a new store or expand a factory, it usually requires a loan. In a recent example, the installation of solar panels on residential homes was a small business, propped up by government subsidy, until the financial industry figured out a way to offer the homeowner a twenty-year lease on those solar panels and the business took off. The list of examples is endless. Finance—the making of loans—is as central as any other factor in driving economic growth. So if, absent calamity, debt growth is roughly commensurate with or greater than GDP, and in fact powers growth, how does a country deleverage without putting a dent in economic growth? Politicians, when confronted with the problem of government debt that is too high, often respond by saying that “we will simply grow our way out of the problem.” Unfortunately, it’s not that simple. Let’s look at how deleveraging has actually been accomplished. In fact, offsetting private leveraging is usually the thing that enables the ratio of public debt to come down. We examined all cases in a top 50 country since 1950 where the data was available. These countries together constitute 90 percent of world GDP. There were 47 cases where public debt as a percent of GDP declined by 10% or more in a period of 5 years. Of those 47 cases, 29 were made possible by an offsetting increase in private debt—not the most desirable way to achieve that end. The next 14 cases happened because of very high inflation—an even less desirable way. The remaining 4 cases were possible because of a very high net export (or capital account) surplus—which is a good way to achieve this deleveraging. While this may seem to offer encouragement, both the level of surplus and number of years of surplus necessary for meaningful deleveraging rarely happens to any major country and has never happened in the U.S. in its 200+ year history. Most cases occurred in relatively small countries. Further, when it does happen in a larger country, as in China from 2003 to 2007 or Germany more recently, it usually brings problematic global imbalances—the very kind that economist complain so vigorously about. The story is similar for private debt. Private debt deleveraging has usually only been possible because of offsetting public debt increases. Japan’s private debt ratio reached a whopping 221% in the lead up to its crisis of the 1990s. But luckily for Japan, its public debt ratio at that time was only 86%. In the two decades following its crisis, private debt has deleveraged to from 221% to 170% (which is unfortunately still too high), but that deleveraging was enabled by a massive increase in the public debt ratio from 86% to 246%. Private debt declined by Y260 trillion, but public debt grew by Y810 trillion, and the combined impact of this debt growth was a meager zero growth in nominal GDP. We looked at all 45 cases where a top 50 country had reduced private debt as a percent of GDP by 10% or more in a period of 5 years. 26 of those cases occurred only when public debt increased at a rate high enough to offset it, 9 cases occurred through very high inflation, and 10 happened because of a sustained and very high net export level. Again, the high net export cases were usually in smaller countries. How about situations where both public and private debt deleveraging occurred at the same time? We examined these same top 50 countries and found only 8 instances where the public debt and private debt ratios declined simultaneously. Six of these were the result of very high inflation. Two were largely a result of a high trade/capital account surplus. So for all of the world’s countries of size, the vast majority of occurrences of deleveraging have been either offsetting growth in debt in another category, or painful inflation. High trade surpluses are a valid path to deleveraging, but they are normally the province of smaller countries, and that strategy is unrealistic for the U.S. since it currently has a large trade deficit and has never had the kind of surpluses needed for meaningful change in its leverage. Actually, it should be no surprise that deleveraging only occurs through these three methods. Absent the help of any of these three methods, if the total debt ratio were to be meaningfully reduced, either through an absolute decline in debt outstanding, or through a decline in the ratio of debt to GDP, it would force significant, damaging downward pressure on GDP. That’s why the years following the Crash of 1929 were so tremendously painful. Between 1929 and 1933, an absolute private debt decline of 21% directly led to a GDP decline of 44%. The years after 2008 were positively mild in comparison: the US government and the Federal Reserve acted to prevent anything more the the slightest deleveraging. During the crisis, a private debt decline of 3% led to a GDP declined of 2%. We were saved from another Great Depression, but we were left with a massive pile of debt. A decline in debt brings a contraction in GDP. We are not at some ordinary point in history. Instead, we are at an unprecedented, era-defining crossroads. Debt to GDP is the highest it has ever been in history. Politicians will not address this, and we will almost certainly continue down this debt path, increasingly burdened by high levels of private debt, ignoring what is in front of us, and wondering why global growth remains so mixed. It is unrealistic to expect the U.S. to be able to deleverage unless there is some strategy beyond these three. By the process of elimination we went through in the preceding paragraphs, we are led to consider one obvious but largely overlooked way: private debt restructuring. It is the primary way that the absolute level of private debt can be reduced without directly impacting GDP. The easiest and most direct way to increase consumer spending (or demand) is to cut consumer debt. The easiest and most direct way to increase business investing is to cut business debt. Take the United States after the 2008 crisis. A rapid rise in mortgage debt was the proximate cause of the crisis—it rose from $5.3 trillion in 2001 to $10.6 trillion in 2007, an avalanche of new mortgage lending in the space of a mere six years. And yet even though we spent billions to bail out most of the lenders pursuant to this crisis (and largely without meaningful consequence to the management of those lending institutions), the amount of help provided to homeowners has been negligible in comparison. In the wake of the crisis, 15 million of 52 million mortgages in the US were seriously underwater, with an LTV above 125%. When coupled with the diminished incomes of many these households, their spending became highly constrained, leaving them far less able to buy new cars, take vacations, and the many other things that power an economy forward. If, during the crisis, we had provided meaningful, systemic relief to these mortgage-holders, the trajectory of our recovery would have been far stronger and our growth rates today would be far higher. Here’s an example of a program that could have been employed in the 2008 to 2010 time period to address this issue (and might be employed in the future). It would have been a one-time program whereby if a borrower, because of the collapse brought on by the crisis, had a $400,000 mortgage on a $300,000 house, the lender would be given a regulatory dispensation to write the mortgage down to, say, $250,000 and spread their loss over an extended period, perhaps 30 years. In exchange, the borrower would provide the lender a certificate that gives them half or more of the upside upon the sale of the house — a type of debt for equity swap. That’s just one example of the type of program that could be deployed, and it relates the US mortgage-centric crisis of 2008. Other crises have primarily involved other types of loans —commercial real estate in Japan in the 1990s and in the US in the 1920s—so they would require different types of programs. This type of program has ample precedents, from England in the 1700s to the Latin American debt crisis in the 1980s, to “Jubilee” programs in ancient civilizations. The imagination of policymakers would need to be guided by the facts of a given situation. The requirement would be that the program or programs be sufficiently broad to meaningfully address the full scope of the problem. We have now entered a new age of slow growth. Economists and policymakers need to recognize the central role played in this by the world’s now-heavy burden of private debt.